Connecting drone from sketches, prayers, and incantations by the solo pianist Tide Jewel, we present “Into The Armory Of Doves”, a sequence of instrumental messages brought about out of years of cosmic abandon, solitude, vertigo, suicide attempts, situational anxiety, and what is historically referred to as “acedia”. This work unites a unique menagerie of influences including Haibane Renmei (created by author Yoshitoshi Abe) and Sylvia Plath poems (selected favorites include ‘Flute Notes From A Reedy Pond’, ‘Crossing The Water’, ‘I Am Vertical’, ‘Aquatic Nocturne’, ‘Gold Mouths Cry’, ‘Apprehensions’ etc.). It also shows the influence of Chihei Hatakeyama and Asuna in its’ ambition and time lengths. Less obvious is the import of noisier acts like the late Jason DiEmilio of Azusa Plane (who Tide Jewel sites as a singular influence with songs like “United States Direct Investment In Other Countries” being a personal favorite), as well as Prurient, Pharmakon, and Merzbow. Tide Jewel would personally like to thank Danji Buck-Moore, of Canada’s aPicturesqueVenusTransit, who told him over the course of a conversation they were having “May you find substance in all that you do”. 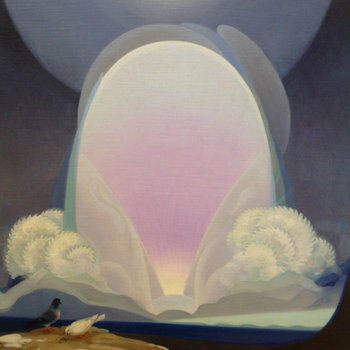 The cover painting is by the late Agnes Pelton, a spiritually engaging work called “Winter” (1933) used with the blessing/permission of Peter Palladino of the Agnes Pelton society. http://www.agnespeltonsociety.com/ May this record find you well. Tide Jewel is a solo pianist who began making electronic music in 2011. Inspired by the home-recording practices of Baths and Oh Land, he/she/it engendered on a path from glossolalic-laptop tunes to electroacoustic drone pieces, inspired by literature, anime, and farming. His style is jokingly referred to as “flower electronics”, since the greatest import of his work comes from listening to nosier acts like Swans, The Blood Brothers, and Pharmakon etc., filtering this mode of listening through his own praxis. All songs are considered “poems” and “prayers”, unfinished sketches to encounter the One. This entry was posted in News and tagged ambient, drone, solitude, Tide Jewel, USA by bsom. Bookmark the permalink.